If you discount the slums of the Lower East Side and Harlem, Manhattan has few ruins. They get demolished and replaced rather quickly. The Madison Avenue facade ruins of the former Squadron A Armory on the east side of the avenue between 94th and 95th Streets is a fine exception and a great example of community activism fighting to preserve part of its history. Armories were once very important landmarks in the city. The 71st Street Regiment Armory, designed by Clinton & Russell in 1905, on Park Avenue at 34th Street had a great tower modeled on a tower in Siena, Italy. It was demolished to make way for a mixed-use tower now known as 3 Park Avenue. 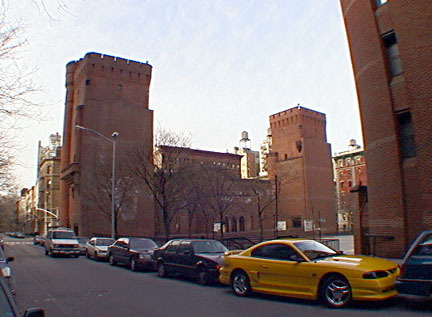 Not many complete armories remain, the most famous being the Seventh Regiment Armory on the west side of Park Avenue between 66th and 67th Street, and the 1851 State Arsenal Building on Fifth Avenue at 64th Street that is now the headquarters of the New York City Department of Parks. "The Eighth Regiment acquired a new building designed by John R. Thomas in 1888-90. It too faced Park Avenue but was far uptown from the Seventh's home, on the west side of the avenue between Ninety-fourth and Ninety-fifth Streets. Thomas had been chosen in a competition held in 1884. ther participating architets including Charles W. Clinton, Hugo Kafka &Co., Lamb & Rich, and A.B. Jones. According to the Real Estate Record and Buildings' Guide, the winning scheme showed; a free treatment of the style that flourished in Scotland in the twelvth and thirteenth centuries, giving means of offense and defense, as well as habitation. The plans originally called for an armory filling the entire block west to Madison Avenue. 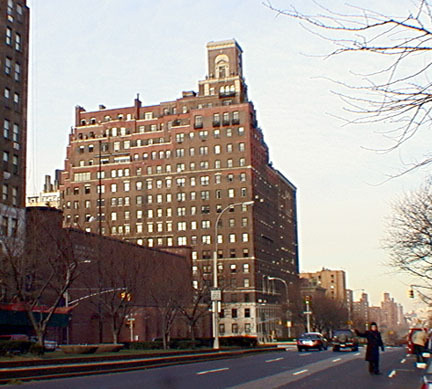 The design was scaled back, however, and in 1887 Thomas had to replan the building to fit only that part of the block extending three hundred feet west of Park Avenue, leaving room for a future armory on the west end of the site, which Thomas would design for Calvary Squadron A in 1894-95. A 180-by-300-foot drill room built in the first wave of construction served both units and lay between the two administration buildings, because it served a calvary unit, this room provided stables and had a dirt floor. The cornerstone of the Eighth Regiment Armory was laid in October, 1888, with the regiment marching to the construction site of its new home from its old Armory on Twenty-third Street, which had been ravaged by fire on Fburary 17, 1878. Like the construction of the Twenty-seond Regiment armory, that of the Eighth was plagued by problems, not the least of which was the destruction by gale-force winds of a high wall in November, 1888. The editors of the Real Estate Record and Builders' Guide deemed Thomas's design the best of the batch of armories following that of the Seventh Regiment, all of which they deemed superior to Clinton's, 'the front of which already looks antiquated, though in fact it is so nearly new.' While they found fault with Thomas's drill hall, which they believed, as in all other similar cases, to suffer form being too low for its size, they took pleasure inthe overall exteior effect: 'The material is baked clay, and is almost entirely common bricks, selected for their color, which is excellent and deep. Terra cotta is used in the crenellated copings that crown walls and towers while a brown sandstone is introduced very sparingly indeed, the sills of the openings and the water-table being composed of it.' The New York Times wen ton to priase it as a model public building: 'To the citizen and taxpayer it possesses an interest beyond its commanding position, its formidable proportions, its straetegic importance, and its evident adaptability ot the purposes for which it is designed. for it is that rara avis on these days of official shortsightedness and shortcomings in high places, an 'honest' building, a structure built within the amount of the original appropriation and pronounced by experts, after painstaking critical inspection, to be comlete and substantial as a whole and in detail.' With its massive crenellated round towers at the Two park Avenue corers, its smaller turrets, its flights of stairs leading to the elevated main floor, its altogether articulated composition, and the predominance of wall over window, Thomas's design unquestionably used in a new phase of armory design: bold massing and simplicity replaced the sketchily picturesque effects of the Gilden Age, reflecting the calm authority of a new era dedicated to scholarly composition and monumental civisism." 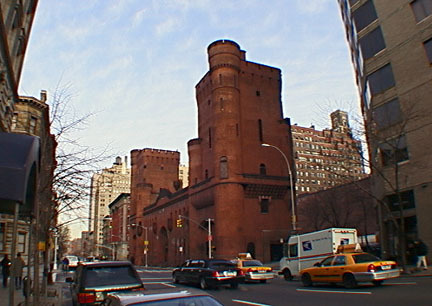 "The monumentally scaled brick building, which resembled a fourteenth-century French fortress, complete with square towers, round turrets and a crenellated parapet, had originally been used by a volunteeer unit called the first New York Hussars or the First Dragoons and later by a National Guard unit; after being used during World War I by the 101st Machine Gun Batallion, it served as one of New York's most unusual recreational facilities: indoor polo grounds. In the early 1960s the building was targeted as the site of a school and subsidized housing. 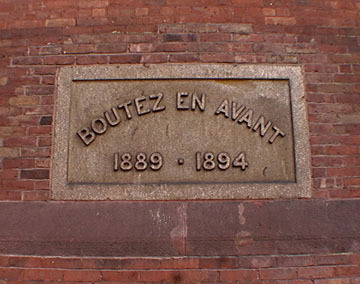 Although the mixed-use project was subsequently abandoned as economically unviable, the armory building was given to the Board of Education for use as the Intermediate School 29. The board concluded that the building could not be structurally transformed to suit the school's functional requirements and rejected proposals by the Municipal Art Society and the New York Chapter of the American Institute of Architects that it be used as a sports center or that a new school building be built within its shell. Late in 1968, after significant portions of the armory had already been torn down to make way for a new building to be designed by Morris Ketchum Jr. & Associates, public protest succeeded in halting the demolition and drawing the attention of the Landmarks Preservation Commission, which designated the remaining western facade, facing Madison Avenue, a landmark on October 19, 1966. Ketchum, who would later serve as a member oif the Landmarks Preservation Commission (1972-79), designed a fortresslike building for Intermediate School 29, with castellated brick facades. He retained the one remaining facade of the former armory as a dramatic backdrop for the school's playground. The Citizens' Housing and Planning Council, which had not favored the designation of the armory facade, dismisssed it as looking 'like a sand castle built partly beyond the reach of the biggest waves.' As for the decision to incorporate the facade into a the new building design, the counil said, it was the result of a 'a moment of bemused sentimentality' and was based on questionable motives:....Although most preservationists welcomed the commission's shift in emphasis toward less obvious designations, the transformation of the building into what amounted to be a monumental sculpture took the concept of adaptive resuse to an almost absurd extreme.'" Morris Ketchum Jr.'s design for the school on Park Avenue is an interesting and laudable departure from the city's typical school structures and it certainly honors the site's history. The Madison Avenue "ruins" are impressive and do not really take "adaptive reuse to an almost absurd extreme." The Madison Avenue facade is not an architectural masterpiece, but is rich color and fine and massive masonry is a great reminder that not everything that has been built afterwards has as much solidity, or romance.